Lawn ranger! Â ditch the cord & gas & cut the grass with MJ24C-14-XR 24V cordless lawn mower from Sun Joe & restore a little eco-friendly âlawn orderâ to your yd with the greener, gas-free grass-grooming solution. MJ24C-14-XR delivers all the power of a gas Machine, with the performance of an electric â with no gas, fumes, fuss, or tangled Extension cords! perfect for small to medium-sized lawns, the powerful, 24V 5.0 ah lithium-ion battery lastsup to 42 Min on a single charge. When youâre ready to mow, simply insert the key, power-up & go! mj24c-14-xrâs 600 w motor & durable steel blade cuts a 14â wide path in a single pass. Featuring 3-position height adjustment â from 1.18â to 2.52â â you can tailor to the perfect, precise cutting height to suit your yd. Collect the clippings with the convenient 10.6 gallon grass bag, & detach for quick & easy disposal. Plus, mj24c-14-xrâs folding, collapsible handle makes storage a breeze! blast past the limits of the Extension cord with cordless power & performance â & mow with Joe! 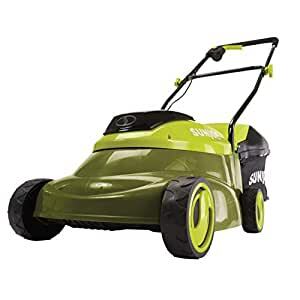 MJ24C-14-XR 24V cordless lawn mower from Sun Joe. Get equipped.